Interactions between each horse personality in the herd can help us make sense of how our horses behave with us. How Does A Horse's Personality In The Herd Relate To How They Behave Towards People? Horse personality sometimes comes across as one thing with other horses, and another entirely with a human handler - the meekest seeming individual with people can turn into a tiger in the field or vice-versa. Observing these interactions gives us a better picture of our horse's whole character (not just the side we see) and thus helps us to understand more about how that horse actually feels about people i.e where we fit in to their lives. For example if a mare who is one of the lowest ranking members in the herd is very bossy with people, what does this tell us? People seem to take it for granted that horses will view us in the same way as they do each other, as long as we manage to 'speak their language' to some degree. It is unlikely to be as simple as this. In reality horses probably treat us according to what 'humans' have meant to them over their individual lifetime. Why should they perceive us as they do their own kind when in a multitude of different ways, physically , energetically and emotionally, we are nothing like them. The most profound difference being our status as predator and not prey animal. Why should it matter anyway? we don't have to be like other horses to the horses we interact with. In fact it is of no particular advantage to us to be considered as the same, as long as our associations with them are positive. Being distinct from the other horses makes us naturally command more respect if we behave intelligently, if only for the novelty value at first. As time goes by and familiarity increases we can replace respect with trust and take our relationship to a new level of compassion which is not always the leading trait in the standard horse personality. Although the herd position of a horse does indicate their individual personality type, which influences their reaction to people, an individual horse's behavior towards humans is ultimately a separate relationship. In terms of horse personality dynamics, it is interesting that the three lowest ranked mares of our larger herd at HHT all have a fairly disdainful view of people, especially on a bad day! The previously neglected ones, Ellora and Jasmine, could be forgiven for never wanting to have anything to do with people again, but in fact they are generous in the way that horses often are. The usual horse personality in the herd of submissive horses is that of those characters who are willing to sacrifice the best food and first chance at water and shelter, for the opportunity to give the responsibility for the herd to the others. They are happy to stay in the background and avoid any heated encounters. Such horses would normally be easier for people to convince of their leadership abilities because they are habituated to following in the herd. If they have suffered bad experiences at the hands of people however, they may be less easy than a bolder horse to bring back from the inner refuges they have sought, their innate reserve becoming caution and eventually cynicism. Ellora (right) was already fifteen when she came to us, and although she has 'lost her perfume' a little towards humans, she will still let down her guard with children and her natural sweetness comes out. 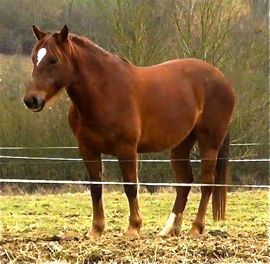 She is not a grumpy mare or hostile in any way, but she has developed a defensiveness which could be perceived as stubbornness, and in terms of horse personality she keeps her distance. The times when she opens up the most are when she has worked well, engaging her body with her rider, and this energetic and physical merging with a rider allows her to let down her guard without feeling vulnerable. An example of reaching her mind through her body. 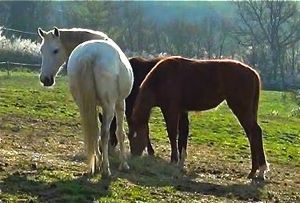 Jasmine (left) is a much younger mare, she was only four when we rescued her from malnutrition. She had also been asked to work in a state where she couldn't even grow properly, and has pelvic and spinal injuries which suggest a serious fall or accident at some time. She is also blessed with a great intelligence and generosity of spirit and it is this which is helping her to overcome her early experiences of people. Other horses have been a refuge for her, but she is timid and shy in the herd situation, so despite her ability to find food and shelter which leaves most of the others far behind, she is happy to stay as Ellora's friend outside of the 'popular' crowd. 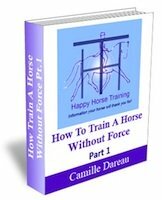 Seeing how her real nature expresses itself with the other horses whom she trusts, her occasional violent reactions and apparent bossiness with people can be easily understood as fear and distrust. 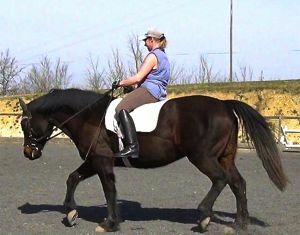 As she improves more and more physically, she is also beginning to open up to gentle treatment which only asks the minimum of her in her work. Her true gentleness is beginning to emerge as she is able to be present with humans. The third mare who was badly treated is probably lower ranked in the herd than her personality would suggest because she only joined relatively recently and she had lost her socialising skills with other horses when we first took her on. 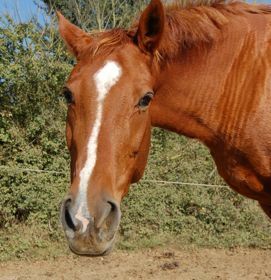 While horses are prey animals and their principle defense is flight (the horse personality in general reflects this) there are certain breeds which tend more towards the fight response. This is true of Lipizzaners, and Octavia is no exception. If she had been more socially practiced she would no doubt have been higher up the hierarchy. Her natural courage became a problem in her encounters with people who were unable to show her how to control herself without resorting to violence, and a vicious cycle of fear and aggression established itself. In fact re-integrating her with her own kind was the most powerful way to reverse this cycle, and when her normal horse personality was restored we could reach her and rehabilitate her distrust and dislike of people. In fact re-integrating her with her own kind was the most powerful way to reverse this cycle, and when her normal horse personality was restored we could reach her and rehabilitate her distrust and dislike of people. Recently when she has been taking responsibility for the new foals we have been integrating into the main herd, she has stabilized her behavior further. This has also coincided with her beginning to establish firmer boundaries for herself in her training work. Because she was forced in the pseudo-dressage way, between spurs an double bridle, she had lost her ability to draw the line. 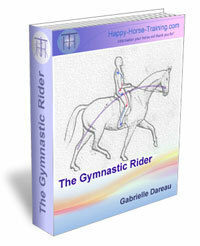 Instead of indicating her anxiety to her rider, she internalized the feelings and they came out in other ways such as stiffness and rushing. 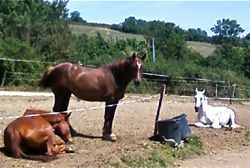 Our observations of horse personality have led us to believe that some horses will develop over reactive-boundaries i.e. they become less and less tolerant, and some develop under-reactive boundaries i.e they become abnormally tolerant. In any unique case there is not a strict rule, but in most circumstances Octavia would allow herself to be abused by a rider when a horse with healthy boundaries would have said no. After she began to associate with the foals though, and her self respect was growing, she began to listen to her body and feel confident enough to indicate when she felt anxious and her rider was then able to work with this appropriately. All three of these mares have been given unmeasurable confidence and support from the herd. None of them had been living in a herd previously and herd behavior was therefore a new way of life. Because it was natural it awakened instincts and feelings in them without which we would not have succeeded in restoring their acceptance of people. Most of us want to try to categorize the world around us so that we can understand it better, and the horse personality is no exception. This certainly helps us see things in ways which help us, but it is good to remember that each individual is just that: unique and individual, and too much trying to fit them into boxes might blind us to what is really going on. For example, there are 'dominant' horses who behave in an aggressive manner as a result of insecurity. Sometimes they might see people as their security if they have experienced sympathetic and confident handling. In this case they will then appear to change personality completely on leaving the herd. Other such dominant insecure horses might distrust people even more than other horses, and display their domineering side to everyone they meet. It is worth knowing that all horses will trust a good leader, and all horses are capable of trusting someone in their lives. The most dominant mare at HHT is Dechie, a small Dartmoor cross TB. She is most dominant because she stops at nothing to control her environment because she has a particularly profound insecurity. She isn't like that because she is 'spoilt' or 'bossy' but because she is frightened. This fear stems from her early experience of neglect. Winning her trust is an ongoing process which is rewarding because she is now laid back and accepting in the majority of handling and riding situations (photo below). A horse personality can be deceptive, and in her case her trust was won by respecting her and showing her that she could feel secure enough to relax, as opposed to trying to impress on her that we were dominant members of her herd. People are not members of a horse's herd, we are a different species and we have different values. We therefore have to meet horses half-way. The interesting thing about Dechie is that the only horse who has ever been 'dominant' over her was her long term partner Tali, now the joint passive leader of the main herd. She would submit to him only because she trusted his opinion and his ability to make decisions, not because he took all the food for himself. The naturally self-confident horse personality usually results in dominant herd members, but often not the most dominant ones because they are not driven by insecurity to hog all the best of everything. They may seem to be the easiest horses for us to work with because they are not suspicious of what we ask of them, but the herd structure does require that someone takes the responsibility. These kind of horses were born in this role and in our experience they are the ones who find it the least natural to let go of. Training them in an especially patient way, giving them enough time in each particular scenario to relinquish their control for a good reason, is crucial. Rushing them along and never letting them assimilate and re-pattern their behavior is the way to end up in a fight as they store up their discontent and at some point it comes out in a big way! A good example of this is how it has been working with Totale, a very confident young mare who has been with us since she was a yearling. She has a naturally bold horse personality and no difficulty putting her large and colourful self right into your personal space! Training her successfully has not been a question of dominating her in the way Dechie does in her herd. In fact Dechie only has to look at her and she will back off, she never approaches Dechie's food and rarely questions her authority. On the other hand they never spend any time together, just sharing each others company. They don't groom each other or go exploring together. Most importantly they don't relax together. This is why their relationship is not what could be described as a trusting bond. Neither is it a pretense where one being is dominated and the other imagines that they have gained the others trust because they will submit to demands without question. The master/slave relationship is common between people and the horses they claim to own, and it may work, but at the expense of the open personality and joie de vivre of the slave. Gaining Totti's respect in a way which means we can do things comfortably together as well as strengthen our friendship has relied on convincing her that she can relinquish her control over the situation and still be safe. She may be a confident horse, but she is confident in her own abilities, not anyone else's! 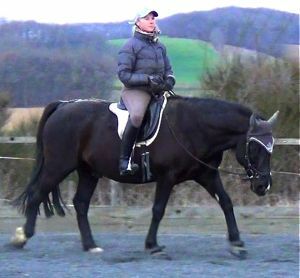 One way to gain Totti's trust and be accepted as her leader is to allow her to look at things when she is being ridden until her attention comes back to her rider and then ask her to continue. 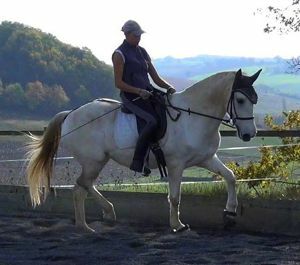 In this way she will have time to see for herself that she is safe until the day comes that she is able to put her trust fully in her rider's guidance. If she were rushed forward and not allowed to assess the threat in her own time, she would not be able to relax during the work session and would therefore never develop trust in her human partner. The common philosophy that a horse is 'taking advantage' or 'trying to get out of work' when they wish to assess threat shows a misunderstanding of the motivations behind horse behavior. A horse is primarily a prey animal and concerned with threat assessment 100% of their waking hours. They cannot enter a deep sleep properly without a guardian during their sleeping hours, which is why many stabled horses suffer from sleep deprivation. 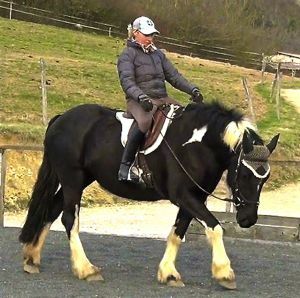 The demands many people make of their horse is similar to expecting someone to drive with their eyes shut and letting their passenger tell them what is going on. Taking them out of the safety of the herd is already stressful, add to that a refusal to give them the opportunity to assess the dangers around them and it is understandable that much horse behavior appears unpredictable and even threatening. When a horse is ready to give us his full attention willingly and remain relaxed, it is a gift we must appreciate for the immense value it has. 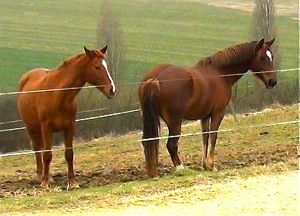 Rafael (right) is another interesting horse personality, partly as a result of him being a rig (chryptorchid). 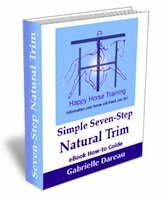 His stallion characteristics meant that it took over a year for him to build up enough trust in his rider that he could walk on a loose rein in full relaxation and attention without worrying about his mares.